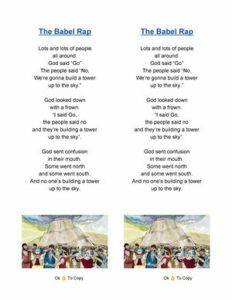 Here are two Tower of Babel activities for kids submitted by a generous reader. Thanks BARB! Use them in your ministry to add something fresh when teaching about the Tower of Babel from Genesis 11:1-9. This is a fun way to experience what the events of Babel would have sounded like. All you need is some colored construction paper, an empty bucket, and some kids ready to make noise! Cut about 1” squares of construction paper…3 or 4 colors. Fold in half or quarter and put in a container. Have the children, one by one, put their hand in the container and get a square. (I did this in the hall while the other teacher stayed with the children in the classroom). They cannot look and see what they want…they cannot tell anyone else what color they got. When all the children have a square have them all say their color out loud (over and over) and look for anyone else that may be saying the same color. When they find someone else…the two continue saying their color name and look for anyone else. Each color group was assigned a specific corner to assemble when they found all the children in their group. It’s amazing…when we stood back to listen to the kids it really did sound like babble!!!! There are many ways you could incorporate this Tower of Babel activity into your lesson time. The whole class could learn it together, or you could have some brave kids perform it as a group. To make it a game, divide the class into groups to see who can say it different way. Have fun! >> Click here to download a printable version of BABEL RAP to use when teaching. Which group can rap it the loudest? Which group can rap it the quietest (while audible)? Which group can rap it the fastest? Tony Kummer (Editor) reviewed & updated this page on : February 17, 2019 at 7:09 pm. All our content is peer reviewed by our readers, simply leave a comment on any post suggest an update.